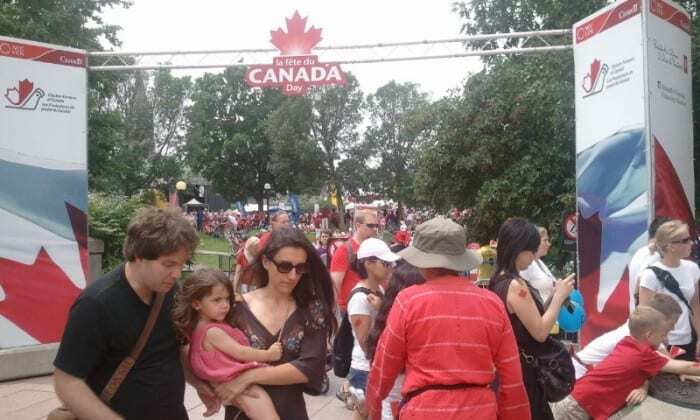 I know, it was over a week ago, but I really wanted to share my impressions of Canada Day! This holiday is one of my favourites, probably because I’m proud to be Canadian, and my mother, who became a Canadian citizen, has taught me how to have pride in the country she has become a part of and to celebrate it. I try pass along this pride to my kids, so, weather permitting, I take my kids to celebrate our nation’s birthday to Downtown Ottawa so they can see and feel all of the excitement of the day with me. I want them to see how so many other people, regardless of their background, come together to celebrate the birthday of our nation. 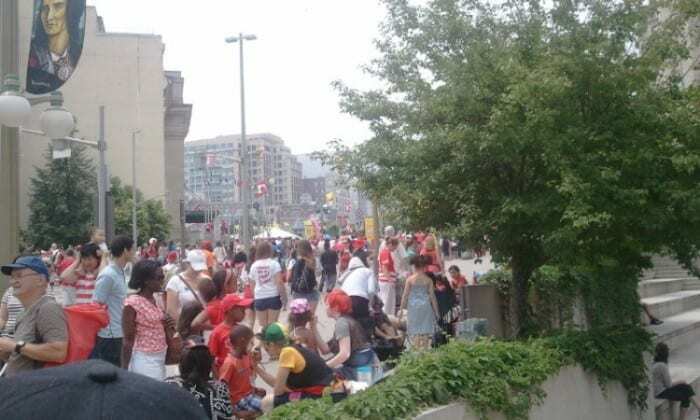 After gearing my kids up in their Canada Day best (anything red and white or with a maple leaf), we made out way to Rideau Street to meet up with all of the other Canada Day revelers celebrating the holiday. This is a shot of just a handful of people on the street just before we were all scared out of our minds by one of the fighter planes flying too low during the air show. People were getting around the downtown core any way they could! On bikes, kids in carriers, strollers and wagons, and some may have chosen the option of using one of these rickshaws! After watching some of the buskers along Sussex Street, we made it to Major’s Hill Park, one of the many venues around Downtown Ottawa set up to provide entertainment for kids young and old. 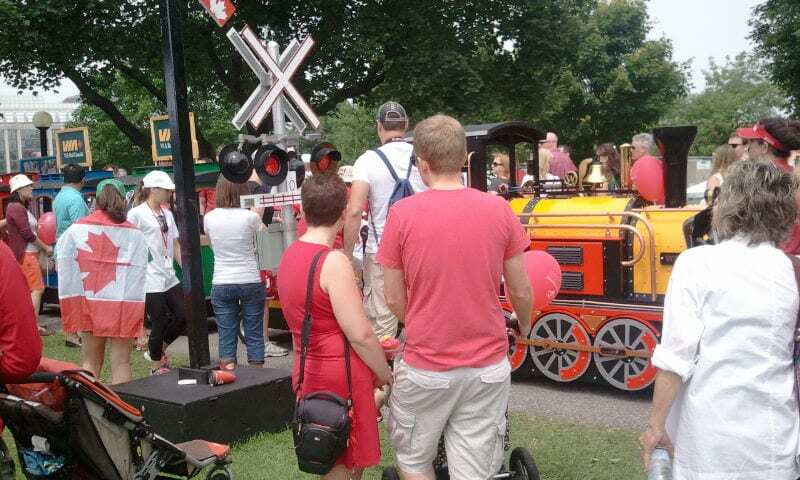 After stopping for a snack and a rest while watching the live CBC broadcast from the park, we got back to our feet and watched as the train provided by VIA Rail took children for a tour around the park. As you can see, the park was so crowded that it was hard to get a good sot of the train. 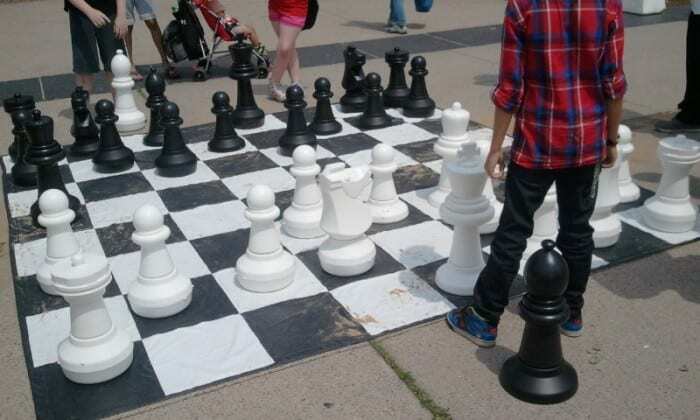 While walking around the park, we found this huge chess board set up for people to play. I’m not sure who won, but these kids were really having fun! After leaving the park and having lunch, we decided it was time to head back home for a few hours to rest up for the events at night. 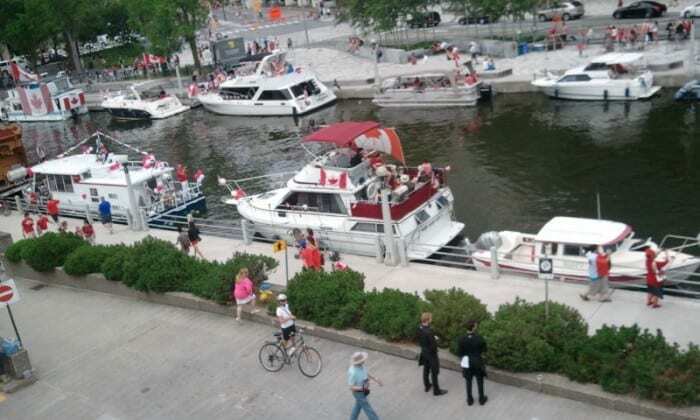 Here are some Canada Day party people who were celebrating while floating down the Rideau Canal while we were on the Mackenzie King Bridge. To end this day of celebrating, I took my youngest and my oldest to see the fireworks that were being set off at the Casino du Lac-Leamy. We watched them light up the sky from the War Museum with one of my mommy friends and her daughter. It was quite a sight to see! Once we got home, the kids past right out from all of the excitement of the day. The day was so much fun that I had forgotten to take my Canada Day antenna headband off until I was washing up for bed! Thanks for following me on my Canada Day adventure with my kids! We enjoy taking a simple stroll around Parliament Hill each time that we visit but there are also free tours of Parliament available for those who wish to learn more about the workings of government. (offered on a first-come, first-served basis) I think my younger daughter is finally old enough that we will probably take the tour the next time that we visit. Kids might also enjoy the self-guided climb to the observation deck of The Peace Tower and the Changing the Guard ceremony which is held daily during the summer months (end of June through end of August). Living in Ottawa, the celebration must be huge. I’m from a small town and we don’t have much but we do have a small parade and fireworks. 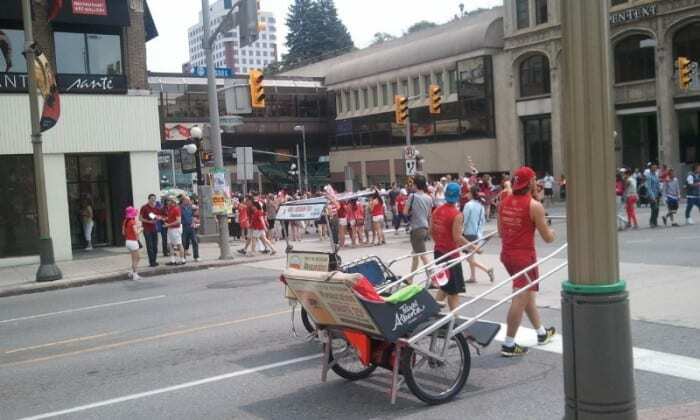 We celebrated once Canada Day in Ottawa, it was so much fun, spectacular and we never forget it! « Cirque du Soleil’s Totem Review ~ A Summer Must See!